A chakra is an energy centre in the human body as taught in Indian yoga and some related cultures. Chakras are also believed in by some New Age adherents. Chakra means 'wheel' in Sanskrit. A chakra is an area in the body connected with life energy. There are seven chakras in the body - each is an interface for the flow of life energy. A chakra vitalizes a physical body and is associated with interactions of a physical, mental nature. Current science is not able to detect or measure chakras. They form part of a subtle energy body, along with the energy channels, or nadis, and the subtle winds, or pranas. They are located along a central nadi, Sushumna, which runs either alongside or inside the spine. Two other nadis, Ida and Pingala, also run through the chakras, and alongside Sushumna. They occasionally cross Sushumna at the location of the chakras. They possess a number of 'petals' or 'spokes'. In some traditions, such as the Tibetan, these spokes branch off into the thousands of nadis that run throughout the human body. 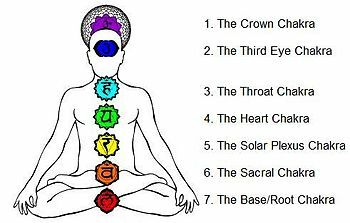 The seven main chakras are described as being present in an ascending column from the base of the spine to the head. The chakras are usually connected with a certain color. Each chakra is also connected with some paryt of consciousness. BelindaGrace (2007). You are Clairvoyant - Developing the secret skill we all have. Rockpool Publishing. http://www.rockpoolpublishing.com.au/books.php?name=you-are-clairvoyant. This page was last changed on 20 April 2014, at 18:06.